At Albany Junior School, we are proud to have supported this years Remembrance Day. Throughout the week; alongside the Stapleford Remembers Community Group and Albany Infants School, pupils have taken part in a number of events to mark 100 years since the end of WWI. 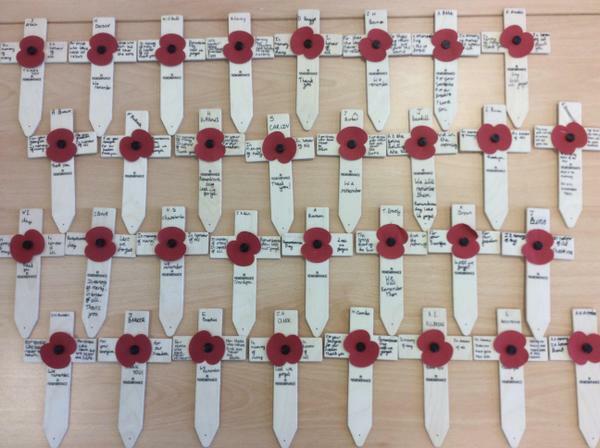 Today, at 11am pupils observed a two minute silence. They were respectful whilst listening to The Last Post and behaved impeccably as they thought about those who sacrificed their lives to ensure our freedom. Today, they have worn red and donated money to the Stapleford Remembers Community Group. Remembrance Sunday, which falls on 11th November in 2018, is a day for the nation to remember and honour those who have sacrificed themselves to secure and protect our freedom. Poppies are worn by millions as a symbol to remember all of the people who have given their lives for their country in war. Armistice Day is on 11 November and is also known as Remembrance Day. It marks the day World War One ended, at 11am on the 11th day of the 11th month, in 1918. Pupils in Year 6 have been learning about Remembrance and the important jobs women carried out during WWI. They have written a war poem in the style of War Girl by Jesse Pope, shared and discussed the text 'The tomb of the Unknown Soldier', found out about the work of Florence Cordell, as well as writing messages of thanks and remembrance on crosses for fallen soldiers - to be laid at the memorial statue in Stapleford. In recent weeks, Rights Respecting Ambassadors have been selling poppies, wristbands, rulers, erasers and keyrings to raise money for the Royal British Legion. They have also, working with pupils from Albany Infants School, decorated the grounds with poppies. This afternoon, members of the Year 6 (Who are Rights Respecting Ambassadors) will be attending a short service, with pupils from Albany Infants School. at the Memorial in Stapleford.